January 12 to 16 was a roller coaster, with a totally surprising Reserve Bank announcement of a 25 basis point reduction in interest rates on Thursday and signaled it could cut further, amid signs of cooling inflation, provided the government continues to take steps to contain the fiscal deficit. So we have an interesting week ahead. My bias is a negative for a low formation and improvement towards the weekend. Next week maybe we have another low (double bottom or lower low) after which the much expected wave c upwards may begin. This might well happen when Mercury is well and truly retro. " As expected, from a high of 8356, during the week Nifty formed a low of 8237 on January 14th and within the next two days reversed powerfully to hit a high of 8527 the very next day before closing the week on Jan 16, on 8514...A remarkable turn of events indeed. 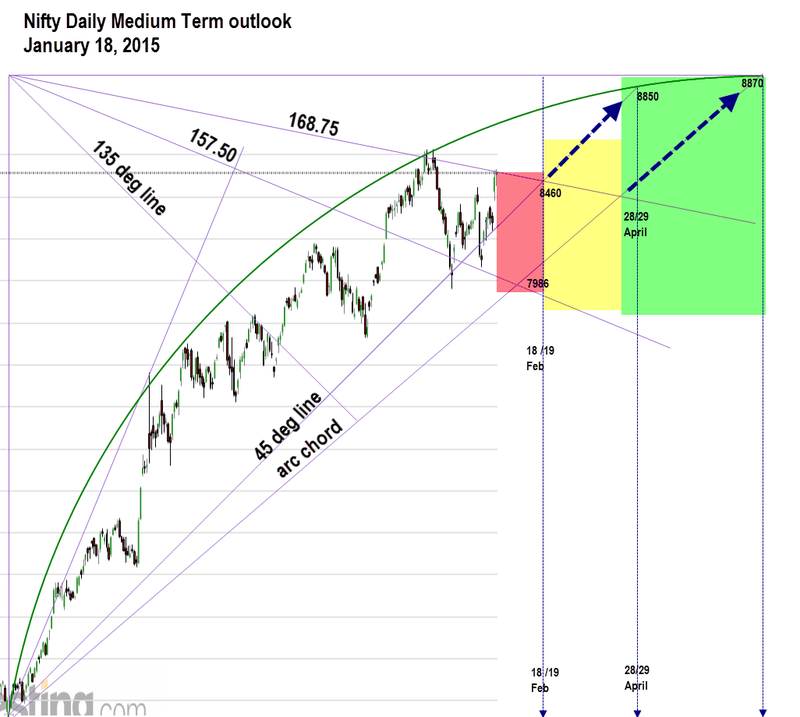 Let us look at the technical picture first…. Nothing has changed as far as the wave counts are concerned. The sudden spurt last week has simply made wave b of b a little longer.Also the horizontal triangle expectation now does not exist..On the other hand, inside wave b we see an expanding triangle formation.We still continue to expect wave b of b to top out and commence c of b downwards..
We see that wave a from 7724 to 8627 took 31 days.Wave b from 8627 downwards has so far also consumed 31 days and we still have the last leg downwards, ongoing,...wave c of b. Wave c of b has begun from 8446 down. This a leg was quite violent and from 8065, b leg has opened upwards. It has so far consumed 466 points and has reached up to 8531.While wave a, ( 8446 down) was a 3 day affair, wave b has so far taken, 7 days, with maximum movement in the last two days. ( actually one day, on Thursday). So technically, wave b has taken more than twice the amount of time as wave a and so it quite mature, may be ready to top.This entire abc formation is taking the shape of a flat with a normal b wave so far.Upto 123.6% of wave a is considered normal for wave b. So wave c of c of b should begin down sometime this week. Only after that, do we expect wave c of xabc to open upwards. 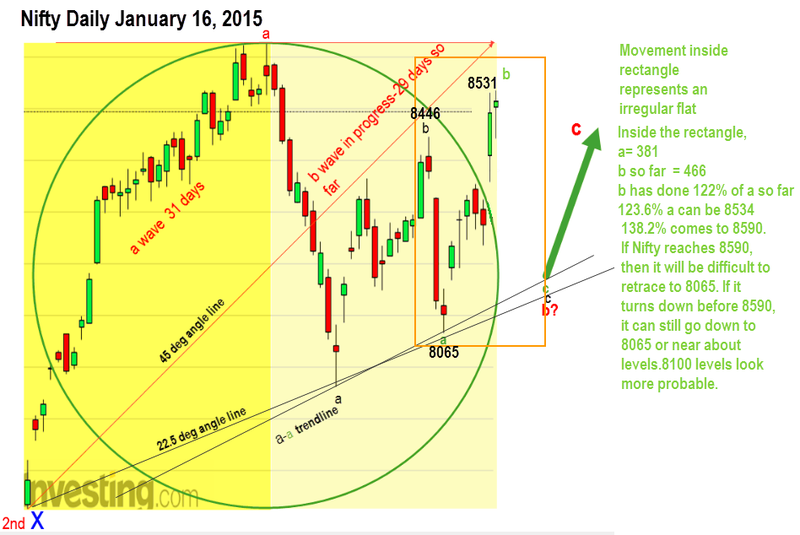 Drawing Gann lines and arcs on the medium term chart of Nifty, we cautiously expect that Nifty may face a down cycle immediately, followed by a volatile cycle with positive bias and a clear green trend from end of March 2015. 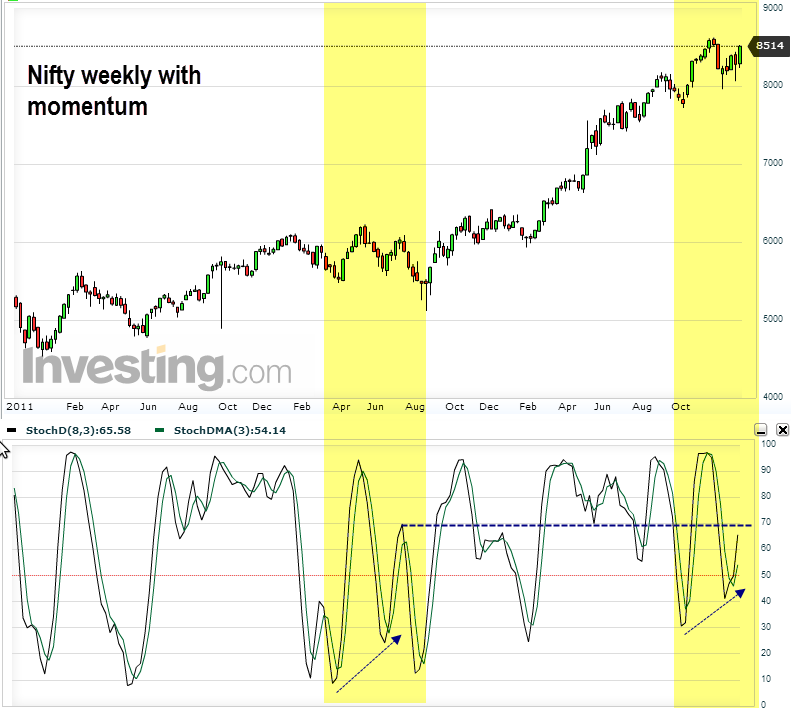 To sum up, our technical outlook for the week is that Nifty may go up some more, but top out sometime early this week and seek lower levels. 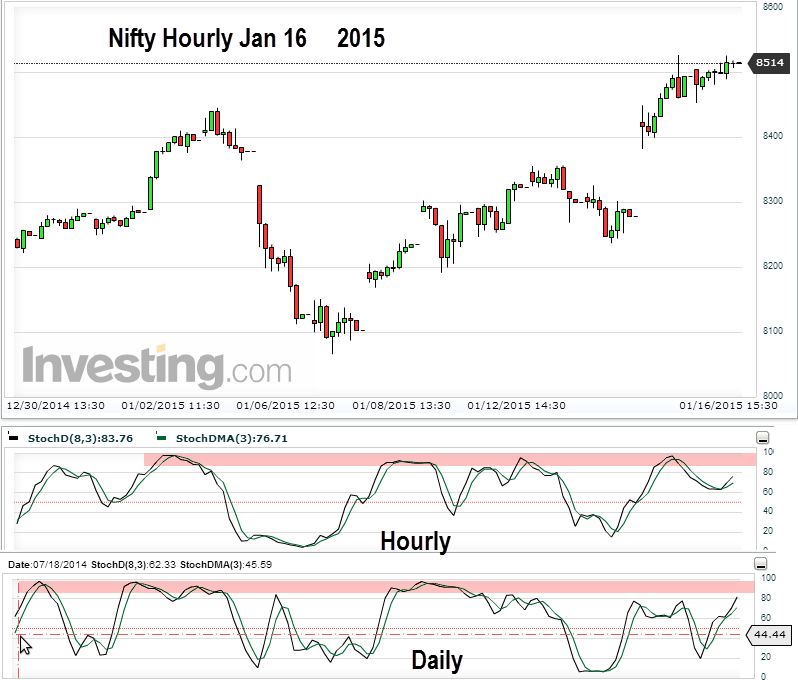 We may book profits if and only if we see three continuous down ticks on the hourly charts. Analyst, wave b is corrective, not impulsive. Then wave c of b downwards start from 21/22 or larger wave c of xabc starts. Please clarify. Wave c of b starts down.That would complete wave b.Larger wave c of xabc is an up wave expected to last longer.Since this is the 2nd xabc and in any complex correction only two x waves are permissible, this larger wave c of xabc will terminate the wave formation of one larger degree.This means what will follow is a much larger correction of the entire rise from 5119 to the top of wave c.Hope Iam clear? Thanks for clarification. It is clear now. Thanks for clarification. Now that nifty has crossed 8590 what will be the downward minimum target for wave c of b and until when can we expect that. 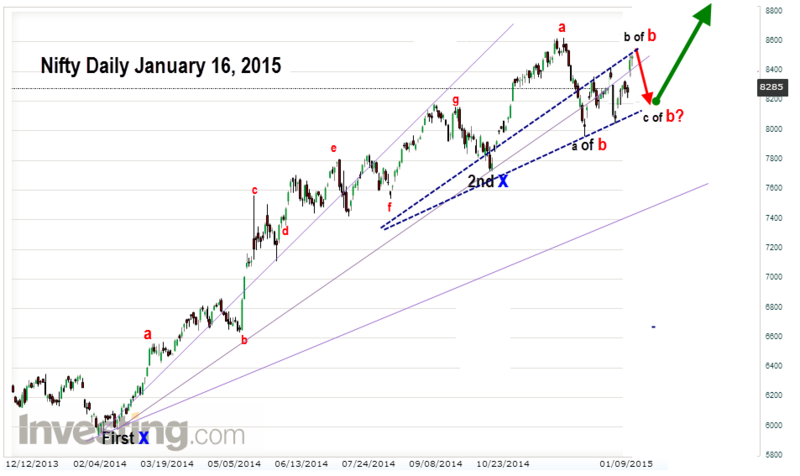 And if Nifty spot cross 8627 is the above wave count still valid. Abbas see the above chart.I expect Nifty to follow the medium term arc.It may turn down from there.The arc point for today is higher than 8627.All it means is that the reversal will now not go to 8065.Taking the previous wave a from 8627 to 7961, wave b has so far done more than a.This makes the a and b of xabc also as an flat with an above normal b wave.That the next c of b is not going to go below 8460 makes the final c wave as quite bullish. Very very nice explanation. Thanks a lot. 8065+666=8731.This ought to be an important number. so if 8731 is not crossed than c of b expected to move from somewhere near 8460 and major c would start upward.